UNDER CONSTRUCTION: We're doing some re-modeling - please check back frequently! Click the photo above to view the entire album. 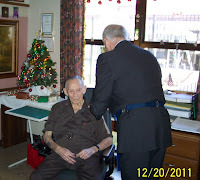 Lodge members and dignitaries visited Brother Larry Hearn in his room in Georgetown, TX, on Tuesday, December 20, 2011 to present him the Masonic Fifty-Year award. Larry is a member of Helotes York Rite Chapter 444 and Council 362, as well as Helotes Lodge 1429.